For one of my classes, I had the opportunity to read “The Tipping Point” by Malcolm Gladwell. I can assure you, this book will make you think, question, and understand ideas and thoughts that you may not normally have or think of. Gladwell starts the reader off with two stories. One of which is about Hushpuppies, an old shoe line, and how they became one of the most popular trends in a matter of just two years. He then goes on to talk about the declining crime rate in New York City. The reason for mentioning these two stories was to explain that things and ideas can spread like epidemics. Glad well goes on to explain The Three Rules of Epidemics, which is ultimately what “The Tipping Point” is centered around. Good ideas can eventually spread and turn into epidemics. However, not all ideas can do so, and thats what Gladwell questioned. Not just how the ideas spread, but why they spread. And thats where The Three Rules of Epidemics come in. The first one mentioned isThe Law of the Few. The Law of Few highlights that when working in a group environment, about 80 percent of the work will end up being done by three people, while the remaining 20 gets split among the rest. I definitely have seen that trend throughout my years in college, and its never fun having to do the majority of the work. However, it can be very rewarding in the end. According to The Law of the Few. these three people are generally known as the Connectors, Maven, and Salespeople. These are the people who know everyone. There is one in every group to. The guy or girl who knows everyone when you go out, or the person who knows all the right people to contact when you need help with something you can’t do. Maven are essentially the people who connectors may try to get in contact with. Maven can be compared to teachers, in the way that teachers tend to know more than the average person and they are always willing to help. Lastly, Gladwell speaks of the salespeople. The salespeople are exactly how they sound, they are the persuaders of the group. Gladwell describes Salespeople as the classic sales person. Someone who who throughly enjoys or loves what they are trying to sell. The fact that they are invested in what they are selling makes the product more desirable by the public. The second rule of epidemics is described as the stickiness factor. The greatest way to explain the stickiness factor is by comparing it to Sesame Street. The classic show we all watched as children did not get off to a great start, but some minor changes allowed Sesame Street to expand into one of the most influential shows in history. The idea of having celebrity guests is just one of the things, along with the shows educational value, that gave Sesame Street that “sticky” factor that draws in such a big audience. Lastly, Gladwell speaks of The Power Context. Basically, this means that human behavior correlates to the environment they live in. The people you grow up around and the area you live in have an influence how one behaves. It’s not always a bad thing though, it just depends on the situation. All in all, “The Tipping Point” was a very informative, but enjoyable read. I can see some of the things I do in my work and how they correlate with Gladwell’s analysis of epidemics. I highly recommend this book to anyone interested in the idea of knowing how and why ideas spread to become bigger and better things. It’s hard to pick from the amount of talented people I have met during my time as a Telecommunications Major here at UF. I see so much potential and success in the near future for many of these inspiring multimedia journalists. Alex and I have had the opportunity to work together a lot this semester. She is my Sports in 60 partner and she has made each shift enjoyable and she was a tremendous help when I was just learning the ropes. She has chosen to blog about food, and who can blame her? I’m always tired of going to the same basic franchised restaurants, so getting to read about new places to eat is always a joy. Check out one of her posts here! I had the pleasure of meeting Sidney last semester during our Investigative Reporting class. Sidney also has a passion for sports broadcasting, and has been doing Sports in 60 updates as well. When we first met, he was sctrictly focused on perfecting his radio craft, but is now comfortable in front of the camera. For those who don’t know, it really isn’t easy being in front of the camera, so I give Sidney a lot of credit. He has chosen to focus his blog posts around Miami professional sports team. Check out this game recap of the Dolphins vs. Steelers game a few weeks ago. I met Britnee as an intern at TV20 here in Gainesville. She was a huge help when it came to giving me advice on shooting high school football, script writing, and editing tips. Not only that, but she was just simply a joy to be around. Having a big personality is huge, especially for the industry we are in. Britnee has chosen to blog about how the natural hairstyle and broadcasting correlate. Luckily for me, I don’t have much to worry about when it comes to styling my hair, but you can see what Britnee has to say about it here. No, the Gators don’t have ANOTHER bye week. However, I am going to take the time to share some of my fellow colleagues blogs. Networking is a huge part of this industry, so taking the time to share other peoples work can only benefit yourself in the future. So with that being said, here are some blogs you should check out. Stephanie is one of the most talented multimedia journalists at the University of Florida. She is the president of the JCA and Anchor’s WUFT News’ First at Five Broadcast. And just when I thought she was all about the news, she even gives people a taste of her sports knowledge in this post. No matter where she ends up, you can guarantee much success in her future. Christian and I were on the same news track from Spring of 2015 until this past Spring. We both had similar aspirations of being ESPN reporters, but he has since realized he prefers the management side of the sports world. We did not get to work together often, but he always had a strong work ethic when we had those few chances. To learn more about Christian, check out his bio! Kady is someone I have had the chance to work with during our days in Radio 1, to our shifts with ESPN Gainesville. Like me, she prefers the sports side of the meida. Living in Gainesville, I have found that high school football is huge around the area. Kady has chosen to blog about various high school football teams in the area, which gives the local audience more of a reason to check out what she has to say; you should too! Let the College Basketball season begin. November 11th marks the start of the 2016 season, and the Florida Gators are ready to get back to the NCAA Tournament. They will be led by players such as senior guard Kasey Hill, and juniors Chris Chiozza and Devin Robinson. 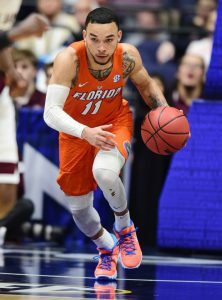 Although Hill is the oldest returning player for the Gators, Chiozza is expected to occupy the starting point guard spot. Gator Head Coach Mike White changed his starting lineup quite often during the 2015-2016 season, but it was Chiozza who started 22 games, while Hill started in 17. Hill scored the ball at a slightly higher rate, but Chiozza averaged more assists, rebounds, shot better from the free-throw line, and had a better assist/turnover ratio. Chiozza is in an interesting position this year. He is officially one of the leaders of this Gator team and should have the spotlight on him throughout the entire season. The Memphis, Tennessee native is a talented player on both ends of the floor, but he doesn’t have the ideal size for an NBA caliber point guard. With NBA Draft Room and DraftExpress not projecting Chiozza to be drafted at all, he will have to prove to NBA scouts that his size shouldn’t factor into his draft stock. The best way to do so will be to perform at a higher level than he ever has in his first two years in college. The Gators had some good moments last season, but playing under a new head coach and having to learn an entirely new system isn’t easy. Chiozza says the team is all in on Coach White this year, and it should make the team better as a whole. The team struggled offensively, especially from behind the free-throw and three-point lines. Chiozza only shot 32 percent from long distance, but hit nearly 80 percent of his free throws. If he can shoot closer to the 40 percent mark from three then the Gators offense will be much more consistent than it has been in year’s past. It’s plays like these that will help propel this Gator squad back to the Big Dance. The Gators lost their leading scorer and rebounder in Dorian Finney-Smith to the NBA, but the remainder of the roster is in tact. The Gators also added three freshman and a graduate transfer in Canyon Barry. Chiozza says the team’s experience is going to play a big factor in the team’s success this season. It doesn’t matter how you look at it; Chris Chiozza is going to play a huge role for the Gators this season. Whether its becoming one of the team’s leading scorers, improving his assist numbers, or just getting it done on the defensive side of the ball, he will be one of the leaders of this team. You can see Chiozza and the Gators in action this Friday night against Florida Golf Coast University. You can catch the game live on SEC Network+, or tune into the Gator IMG Sports Network to hear the call.